1. Just tell your child the word if they don’t know it – no fuss. 2. Sight words are not to be sounded. 3. Use a pencil and point to each one. 4. Make up cards with sight words on it. 5. Put a word of the day on the fridge. 1. Use the pictures as much as possible. 2. Remind the child to sound the letters. 3. Be patient and kind. 4. Praise a lot: “good reading”, “great sounding”. 5. Cover half of the word up if it is a long word eg. Jumping (cover-up ing). Choose a book you are comfortable reading. Reading a book many times is fine. Read every night to your child until the late primary years. Adult reading courses are available to help. Try and practice your speaking as much as possible. I know it can be awkward, but most people will help you kindly. If you can join a speaking group that would be great too. Stuck starting an essay or are you considerably below the word count? 1. Grab the assignment sheet and make notes about the requirements (this should take 10-20 minutes) because understanding the task is vital. 2. See the example diagram below. Choose your direction and brainstorm your idea. Write your idea in the centre of a blank page and circle it. 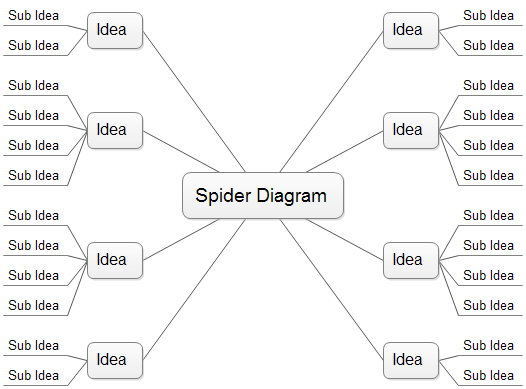 Then draw lines from your central idea and it looks like you have drawn a spider! 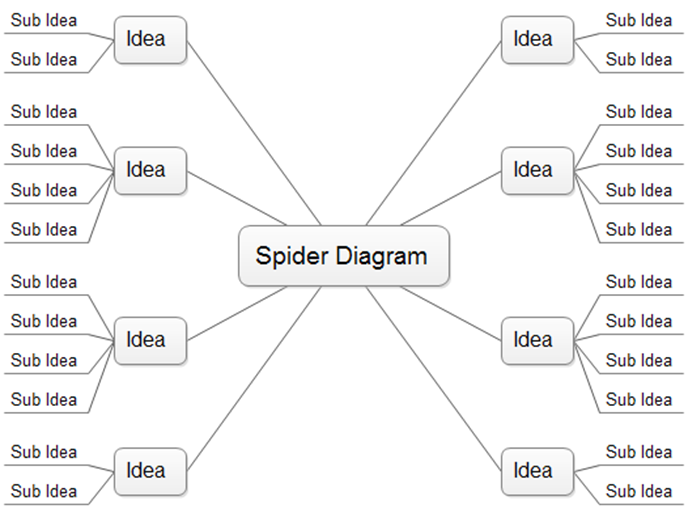 Now, write 4 or 5 minor headings to support your main idea at the end of each spider leg (the number depends on your assignment length; 4 or 5 subheadings would suit an assignment that was 800-1200 words in length). 3. Under each minor heading write 5-10 ideas that link back to your main argument (in the centre). When writing each body paragraph it is important to follow a structure known as TEEL (topic sentence, example, explain, link). 4. Number the minor headings in the best order and it might also help to write linking ideas here too. 5. Number one becomes your introduction or thesis and the rest of the paragraphs support your argument and become separate paragraphs. 6. Sometimes it is necessary to do a second brainstorm design and perfect it. 7. If each sub-heading is thought of as a mini essay, the writing task is not so daunting! 8. Do not write your essay until you are happy with your brainstorming efforts. 9. You deserve a break after spending quality time on your brainstorming ideas. 10. Start your essay and remember to write a decent introduction and a meaningful conclusion and ensure each paragraph links to the next. A work mate referred me to this site. Thank you for the information.